Today the cattle were in a sweet spot to be moved to fresh pasture. With temperatures still rising into the 90’s each day, it is important to take advantage of a cool morning. Cattle prefer to be called into a new field rather than pushed. It is one of the most important lessons for apprentices at Smith Meadows. Stubborn in the face of frustration and easily tempted by cool water and shade, cows can be tricky to convince if the scene is not properly set. In this case they had moved down to northern end of a hilly field full of old apple trees. A few of the herd had already moved into the new field in the middle of the night. Once the fences were checked and tightened in the morning, a crew of two apprentices (Aaron & Lars) and our farmhand Robert set to work on moving the rest of the herd into a shady piece of pasture under old growth sycamores. Watching cows being called and moved is a rewarding experience. In a sing song voice Robert begins to yell, “COME ON!” The cattle then respond with their own calls as a chorus of bovine voices rises from the distance. Once the ladies have informed each other that a familiar & safe voice has called them, they slowly lope in an orderly line toward the apprentices and farm hand. As they come onto the road, the ladies stop for a little snack. It is so tempting to walk by new green grass and not take a nibble. The sight of them all in a row as they munch away is such a lovely contrast to feed lot cows in a row at the trough. Of course there are other more challenging distractions such as the stream that runs through the farm. As they pass Long Marsh Run it is important to have an experienced person on all sides of the herd gently encouraging each cow to move in the right direction. If they sense they are being pushed, they will most likely move right where you don’t want them to be– the old field. With a few of the herd in the new field and experienced handling, it does not take long to convince everyone to cooperate. The entire process of moving a herd of 100 takes about 20 minutes on a day like today. Take a look for yourself and watch how well it all can go with the proper handling. As you can see, it is a pretty neat part of the job at Smith Meadows. And here is our happy crew at the end of their task. 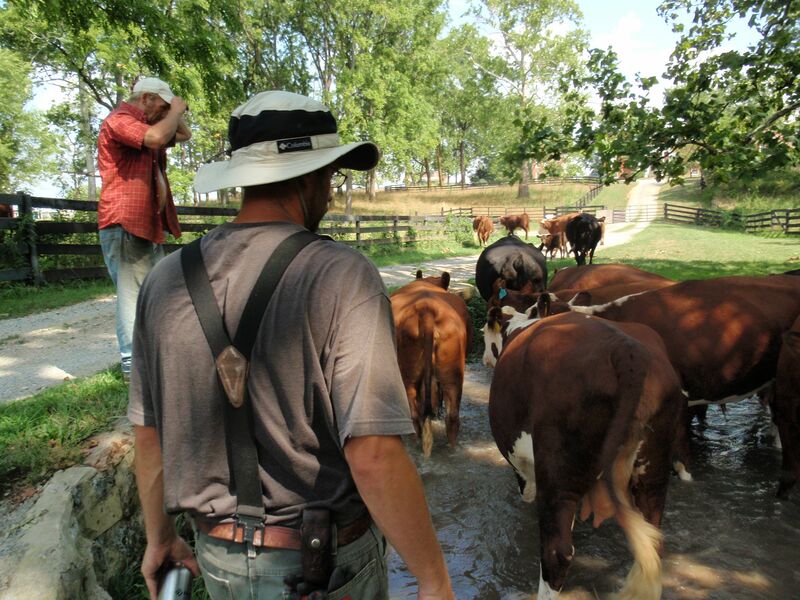 If you’d like to see more of our cattle got to our photo album on Flickr. Thanks for wanting to be added to our email list.